Nuclear Minute: Will Nuclear Power Plants in the United States Experience Life beyond 60? Figure 1 has been updated to reflect category changes to Hope Creek and Salem in New Jersey as well as Palo Verde in Arizona. As a result of laws passed in New Jersey on April 12, Hope Creek and Salem have been moved from the “in jeopardy” category to the “reprieved” category. Additionally, after an announcement by Arizona Public Service Company that Palo Verde nuclear station could close if the state amends its constitution to require utilities to get 50% of their energy from renewable resources, Palo Verde has been moved from the “operating plant” category to the “in jeopardy” category. Figure 1 will be refreshed to reflect modifications in plant categories as developments affect the prospects for certain units in the U.S. nuclear fleet. The United States has embarked on actions to combat climate change by putting a focus on lowering the carbon emissions from the electric generation sector. A pillar of this approach is to promote the greater use of renewable resources, such as wind and solar. The past decade has seen significant growth in carbon-free energy from wind and solar. Generation from these resources reached 333,000 GWh in 2017. However, unbeknownst to many who care about climate change, most of the progress made to date through renewables is at significant risk due to the loss or potential loss of more than 228,000 GWh of nuclear carbon-free generation. Over the past decade, wind and solar have grown in large part due to policies such as renewable portfolio standards, federal tax incentives, and in some cases state tax incentives. Few would argue that the addition of renewable generation is a critical element of a comprehensive carbon-reduction strategy. Since 2008, the policy focus on renewables has attracted hundreds of billions of dollars of investment for the development of wind and solar. The results have been significant—in the past decade 90% of the current operating wind and solar capacity was added, to additions of roughly 75 GW of wind and 52 GW solar.1 Another result of these investments has been to help wind and solar drive down the cost curve reaching a more competitive position. The policies promoting renewables have clearly contributed to the addition of a meaningful amount of carbon-free electricity as well as to jump-starting an industry in the United States. For each “at-risk” category, we calculated total capacity and annual generation.5 As seen in the table below, more than 28,000 MW of nuclear capacity has retired or is facing early retirement. The 228,045 GWh of nuclear generation retired since 2008 or at risk of early retirement represents 5.6% of total U.S. net generation in 2016. 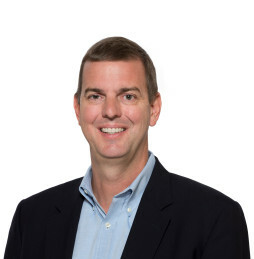 To understand the potential impact on carbon-free energy, ScottMadden compared “at-risk” nuclear assets facing early retirement to all wind and solar assets operating at the end of 2017.6 As discussed previously, there has been great publicity around the wind and solar capacity that has been added over the past decade. If compared on this popular measure, nuclear capacity at risk of early retirement only accounts for 20% of the total 2017 renewable capacity. If at first glance, it is not that alarming, it is because capacity is not the right measure to show impact on carbon. To understand that, we must compare on electric output, or energy. When compared on energy output, the potential loss of nuclear presents a greater concern. With capacity factors greater than 90%, losing a smaller amount of nuclear can produce outsized impacts on carbon-free generation compared to the low-capacity factor of wind and solar (35% to 22%).7 In 2017, wind and solar produced a combined total of 333,000 GWh of carbon-free generation (see Figure 1). This gain has the potential to be reduced by 68% or 228,045 GWh through the early retirement of nuclear capacity. In fact, the United States has lost 11% of the renewable generation from plants already retired. 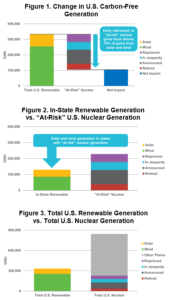 In the states that host “at-risk” nuclear assets, the potential lost carbon-free generation from nuclear energy exceeds total in-state renewable energy generation (see Figure 2).8 This represents a significant barrier to achieving near-term state-level reductions in greenhouse gas emissions. A further potential challenge is the relicensing of nuclear plants. Those plants not currently at risk of early retirement must renew their operating licenses with the U.S. Nuclear Regulatory Commission in the next 20 years. If these plants do not renew their licenses, even more carbon-free generation would be lost. In fact, wind and solar output would need to more than double just to break even on the loss of carbon-free generation from the retirement of the entire nuclear fleet (see Figure 3). Investments in renewables have made a significant contribution to emission-free electricity generation. For those concerned with climate change, this represents a meaningful step in the right direction. 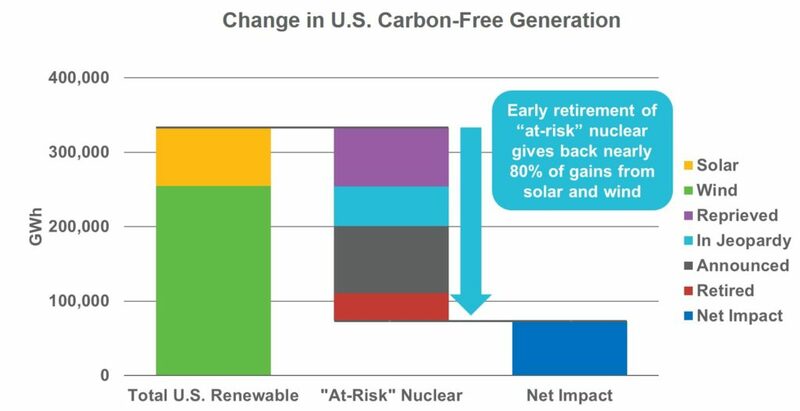 The early retirement of “at-risk” nuclear, however, puts the United States in danger of “giving back” an amount equivalent to two-thirds of the overall carbon-free generation supplied from wind and solar. In states with these nuclear assets, the loss represents a significantly larger impact. The losses could become even greater if more nuclear plants do not renew operating relicenses. If nuclear plants are not saved in the near term, it will put the entire industry at risk. For once a nuclear plant shuts down, it will not come back. If enough nuclear plants shut down, a tipping point may be reached for the entire industry in the United States, and we will lose forever that carbon-free generation. While one might argue that in the long run, this nuclear hole may be filled with renewables and other evolving clean technologies, in the near term it is certain that a rapid and deep carbon reduction will require these nuclear assets. Data obtained from Bloomberg New Energy Finance’s 2018 Sustainable Energy in America Factbook. Wind capacity is reported in AC; solar capacity is reported in DC. New York State Department of Public Service, Governor Cuomo Announces Establishment of Clean Energy Standard that Mandates 50 Percent Renewables by 2030. Forbes, Illinois Sees The Light – Retains Nuclear Power. December 4, 2016. Connecticut Department of Energy & Environmental Protection Connecticut Public Utilities Regulatory Authority, Resource Assessment of Millstone Pursuant to Executive Order No. 59 and Public Act 17-3; Determination Pursuant to Public Act 17-3. February 1, 2018. Capacity was calculated using net summer peak capacity obtained from SNL Financial. Generation was calculated using 92.3% capacity factor, which represents the average capacity factor for the U.S. nuclear fleet in 2016 as reported by the Energy Information Administration. Average capacity factor of utility-scale generators in 2016: nuclear 92.3%, wind 34.5%, utility-scale solar 25.1%, and solar thermal 22.2%. Source: Energy Information Administration, Electric Power Annual. Distributed solar capacity factors are often below 20%. These states include California, Connecticut, Florida, Illinois, Iowa, Massachusetts, Michigan, Nebraska, New Jersey, New York, Ohio, Pennsylvania, Vermont, and Wisconsin. The New York Times. Germany’s Shift to Green Power Stalls, Despite Huge Investments. October 7, 2017. The Economist. 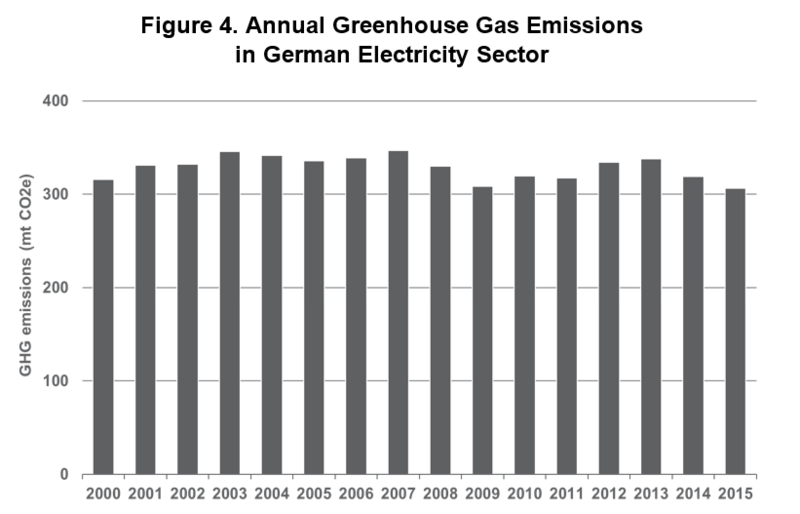 Is Germany’s Energiewende Cutting GHG Emissions? March 20, 2017. Union of Concerned Scientists. A Huge Success in Illinois: Future Energy Jobs Bill Signed Into Law. December 8, 2016. The Washington Post. Why Climate Change Is Forcing Some Environmentalists to Back Nuclear Power. December 16, 2014.